Aaaah I'm back and for one of my favourites 'Chocolate'! Thank you Kathleen for my favourite Chocolate theme in time for me to pick up the pace on my food blog as well. Kathleen Coe Clegg is the wonderful hostess of our October's theme 'Chocolate' over at Foodie Extravaganza. She is the owner of 'Fearlessly Creative Mammas', a wonderful blog sharing recipes from her home. This time I wanted to do something similar to cake pops except it is presented a lot differently. I enjoyed making this treat as I knew my little girl would love it. She absolutely loved it and thinks I should sell it. She added that she thinks there is only one problem, no one who eats it will want to leave our home. She even tried to convince her grand dad (my dad) to have one. She said "It's homemade!" 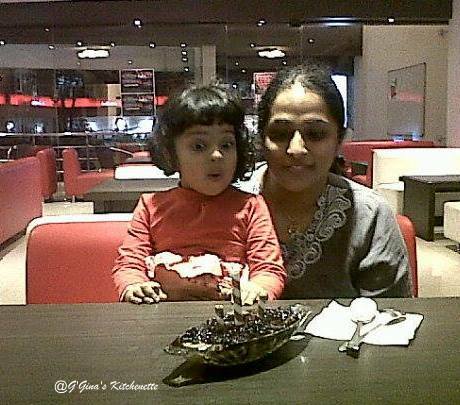 :D. She is a Chocolate fanatic just like her mom as you can see from her expression in this photo of the two of us sharing a bowl of layered ice cream at The Chocolate Room in Hyderabad, India two years ago (New Year's Day dessert). The surprise here was meant to be the caramel but I am not sure it is! In my daughter's case the surprise is the Chocolate outer and inner as well. The Crispy element can be made crunchier in case you cook the puffed rice with a layer of powdered biscuits (Marie biscuits) and set to cool. For want of time, I could not. I will try it next time and let you know how it goes. 1. Preheat the oven to 180° C. Butter a cake tin of any dimension. The size doesn't really matter as the cake will be deconstructed. 2. Mix the cocoa powder in the warm water until smooth. Whisk the flour, sugar, baking powder, baking soda, salt in a bowl and set aside. 3. Whisk the eggs until light and fluffy and add the butter to it and whisk well. Mix the egg mixture into the flour mixture until smooth. 4. Transfer to the prepared cake tin and allow to rest for 20 minutes before baking for 30-40 minutes until risen. Set aside to cool. 5. Deconstruct the cake into powder and add 1 tbsp milk and 1 tbsp butter and mix well till a dough can be formed. Set aside. 1. Heat a pan and add the sugar to it on medium-high. 2. Once the sugar melts and begins to turn into a golden brown, add the hot water and cover evenly. 3. Once the caramel turns an amber colour, turn off the flame. The caramel colour will deepen once rested. 1. Add the cocoa powder and warm water and heat lightly on sim whilst stirring. Once it starts to boil turn off the heat and mix the butter in well. 2. Add the puffed rice, mix well and allow it to cool to room temperature. 1. Divide the cake dough into 8 parts. Roll each one into a ball and flatten it in your palm. Add a tsp of caramel sauce in the center and roll back into a ball. Do this until you finish all 8 balls. 2. 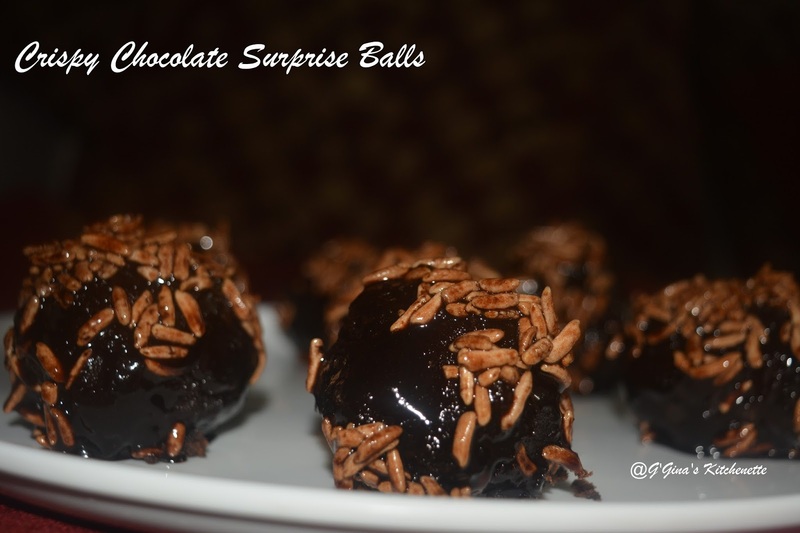 Place the cake balls on a rack and pour the cooled chocolate sauce with puffed rice using a ladle over each ball. Allow it to cool at room temperature. 3. Transfer to the fridge. Serve cold. Your kids will love this treat. This looks like a perfect bite of goodness! What a great recipe!! Yum! Thanks Elaine :) I love it when I get reviews from little ones. I just got a thumbs up from my neighbours' darling 5 yr old and a suggestion to sell these treats from my little darling 6 yr old. These look SO chocolatey and tasty! I can't wait to try them. You are so right about kids being the best food critics Georgina and I can see why these crunchy little gems were a big hit with them. What lovely and fun treats! What a fun idea- kids would love this! Your little girl is adorable! These chocolate bites look like a chocolate lover's dream! Your daughter is a cutie. You're right, if kids son't like something, they will tell you for sure. If they like something, it's a winner! Thanks Kathleen. Yes that is true-Excellent food feedback from the little ones. Thank you!